Dressing up and looking amazing in a beautiful off shoulder dress is the dream for most of us. However, most of the times this dream is ruined with you having to constantly pull up the strapless bra underneath the dress to protect your modesty. The constant pulling totally takes away from your overall look, and is noticeably cringe-worthy. Have you wondered how some people seem to have no problem at all with their strapless bras? 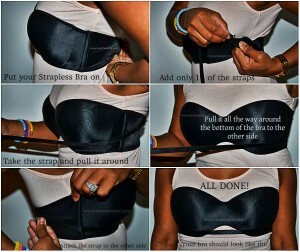 Don't just wonder; instead, check out these ways to keep your strapless bra from falling! If you keep wearing a strapless bra that has long since crossed its expiry date then you are bound to face problems. A worn out bra will loosen up from various places and won't give you the support it is supposed to. So chuck out the old and dying number, and go out and purchase a new one. When you select a strapless bra, go for one which fits perfectly when clasped on the loosest hook. After multiple wears the bra will loosen up. Buying one that fits on the loosest hook will give you the option to keep going a hook further, before it wears out enough for you to chuck it out. When you go strapless bra shopping, as much as your heart may tell you to go for the petite and fancy band one, don't! If you want your strapless bra to really hold up your ladies, then you need a bra that has a broad back band. The back band should be able to make up for the missing straps, so the broader it is the more support it will give you. A longer strapless bra that essentially covers or goes up to your rib cage or torso will give you a better hold and also prove to be more comfortable. A bra that is closer to a bodice is a good option, especially if your top or dress is one that covers the bra up. As much as possible, search and opt for a bra that has a rubber lining on its inner seam. This rubber lining helps the bra adhere your skin better, preventing it from slipping below. Most strapless bras come with detachable straps, and the right usage of those straps can make all the difference. Take one strap, and attach one end of your bra, now stretch it out in the front (from below your cups) and attach the other end to the clasp on the other side of your bra. This will lend added support to your strapless bra. And lastly, when all else seems to fail (which I sincerely doubt will) take some help from the ever-so-helpful safety pins. Pin up your bra to your dress or top and the chances of it falling down will become close to nil. Just make sure to pin them from inside to avoid the piece of metal from shining. Better still, try to find some pins that resemble the colour of your outfit.